Send your best wishes by delivering this Pretty Pink and White Romper by MiniKlub to the new member in the life of your dear one. 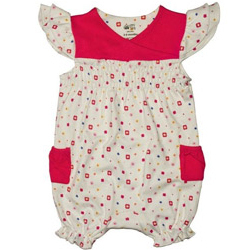 This Romper has been designed by the leading designers : MiniKlub. Keeping the quality in mind, the Romper has been tailored out of fine Cotton to make the little ones feel soft and comfy.